What a great concept! Especially if you like to eat pistachios while watching tv (guilty). This double dish bowl works great for edamame, cherries, olives, pistachios, wrapped candy, and sunflower seeds. Basically anything that you would eat and need to discard a seed, shell, or wrapper. What a fabulous gift idea! What to do with that dripping spoon? 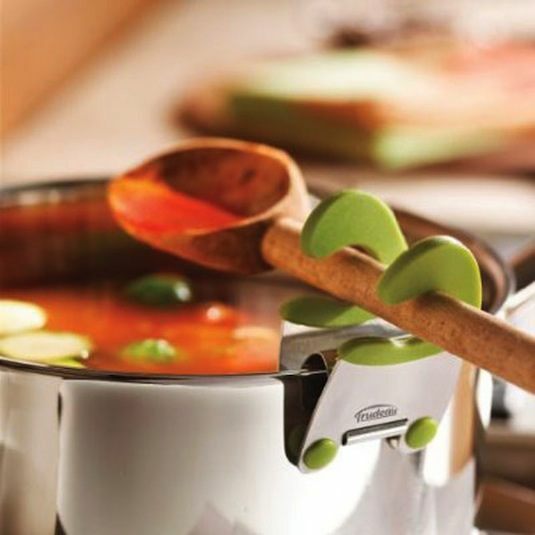 Hmm, how about a pot clip that allows you to rest your utensils right over the pot!? It will keep your stovetop clean and your spoon handy. This silicone whisk is basically two essential tools in one sleek design! And, the silicone coated wire is perfect for your non-stick pots and pans. Use it to whisk your ingredients together, and then with a simple twist, use the same tool to scrape the ingredients out of your bowl or pan. Did I mention that because of it’s design it’s also a drawer space saver? Just another bonus!